AgeX Therapeutics, Inc. (AgeX), a subsidiary of BioTime, Inc. (NYSE American: BTX), today announced a newly-published peer-reviewed study that reveals genes implicated in tissue regeneration, cancer, and aging. The study, by scientists at AgeX and BioTime, in collaboration with Insilico Medicine, utilized artificial intelligence (AI) technology to parse millions of gene expression data points to decipher the complex mechanisms controlling natural tissue regeneration. The results, published in the peer-reviewed scientific journal Oncotarget, showed that the candidate genes are expressed differently in tissues early in development when they are capable of regeneration compared to later in life when regeneration can no longer take place. Surprisingly, some of the genes, including one highlighted in the study, COX7A1, displayed a rare profile of being nearly universally dysregulated in diverse types of cancer. The discoveries may lead to novel strategies to induce Tissue Regeneration (iTRTM) in the context of trauma or age-related degenerative disease, as well as treat and diagnose cancer. A short video is available online describing the discovery and its implication for product development at AgeX. Included in the video is a discussion of an iTR product designated RenelonTM, which, in its first generation form, utilizes a repurposed drug and may therefore have a relatively short development timeline. The leading unsolved problem in medicine as the year 2018 arrives remains the inability of the adult human body to regenerate tissues affected by injury or disease. It is estimated that approximately 80% of the nearly $3 trillion annual health care expenditures in the United States can be attributed to chronic disease. The chronic degenerative diseases of aging are also on the rise due to the aging of the 76 million post-WWII baby boom population. AgeX is focused on developing breakthrough technology platforms to directly address some of the largest markets associated with this demographic. One such platform is induced Tissue Regeneration (iTR), the subject of today뭩 scientific publication. Adult humans, like most mammals, have only a limited capacity to repair tissues in the body resulting from trauma or degenerative disease. However, in some species, such as the Mexican salamander, there exists a profound capacity to regenerate injured tissues, even amputated limbs. Recent studies suggest that this power reflects a capacity present early in life and largely lost by the time we are born. 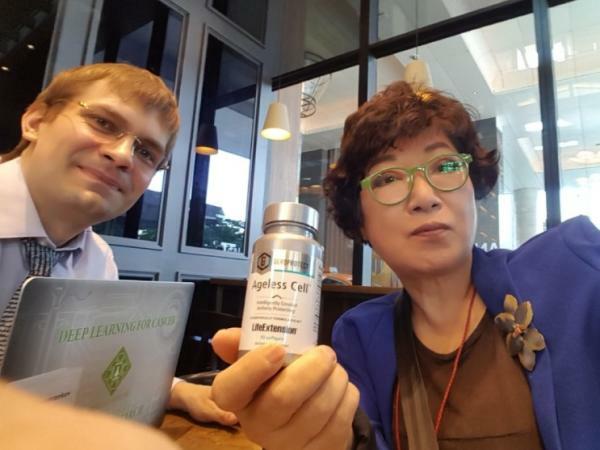 Using the Company뭩 proprietary pluripotent stem cell-based platform, AgeX and BioTime scientists compared cells with the potential to regenerate tissue in humans, similar to that occurring in naturally regenerating animals, with adult cells lacking the capacity. The transition from an embryonic capacity to regenerate tissue to the subsequent loss in adults (replaced by scarring rather than regenerating) is one of the most complex processes studied in biology today. Therefore, AgeX scientists collaborated with Insilico Medicine to apply machine intelligence to better understand the process. A computer-based analytical tool designated "Embryonic.AI?resulting from this AI research is available online at AgeX database LifeMap Discovery. The study resulted in the identification of genes differently expressed during the time tissues can regenerate compared to later in life when that capacity is impaired. One gene highlighted in the study is designated COX7A1 which is thought to play a role in energy metabolism along with other critical functions in the cell. Consistent with a role of COX7A1 in regeneration and cancer, the gene appeared to be profoundly dysregulated in a broad array of cancer cell types, suggesting cancer may be thought of as 뱑egeneration out of control. ?As a result, the discoveries reported in today뭩 publication may have the potential to lead to the ability to induce scarless tissue regeneration in humans, as well as point to new strategies for the diagnosis and treatment of cancer. The publication titled 밬se of deep neural network ensembles to identify embryonic-fetal transition markers: repression of COX7A1 in embryonic and cancer cells? (Oncotarget, December 2017, in press, https://doi.org/10.18632/oncotarget.23748 included Michael D. West, Ivan Labat, Hal Sternberg, and Dana Larocca of AgeX; Igor Nasonkin and Ratnesh Singh of BioTime; Karen B. Chapman and Evgeny Izumchenko of Johns Hopkins University; Karen Copeland of Boulder Statistics; and Eugene Makarev, Alex Aliper, Andrey Kazennov, Andrey Alekseenko, Nikolai Shuvalov, Evgenia Cheskidova, Aleksandr Alekseev, Artem Artemov, Evgeny Putin, Polina Mamoshina, Nikita Pryanichnikov, Ksenia Lezhnina, Mikhail Korzinkin, and Alex Zhavoronkov of Insilico Medicine. HIV patients in 2017. Submission for approval of Renevia?/sup> in the EU is expected to be early 2018, with possible approval and commercial launch in 2018. There were no device related serious adverse events reported. OpRegen?/sup>, a retinal pigment epithelium transplant therapy, is in a Phase I/IIa multicenter trial for the treatment of dry age-related macular degeneration, the leading cause of blindness in developing countries. There were no related serious adverse events reported. BioTime also has significant equity holdings in two publicly traded companies, Asterias Biotherapeutics, Inc. (NYSE American: AST) and OncoCyte Corporation (NYSE American: OCX), and a private company, AgeX Therapeutics, Inc.">BioTime is a late-stage clinical biotechnology company focused on developing and commercializing products addressing degenerative diseases. The Company뭩 current clinical programs are targeting three primary sectors, aesthetics, ophthalmology and cell and drug delivery. Its clinical programs are based on two platform technologies: pluripotent cells, which can become any type of cell in the human body, and cell/drug delivery. Renevia?/SUP>, a cell delivery product, met its primary endpoint in an EU pivotal clinical trial for the treatment of facial lipoatrophy in HIV patients in 2017. Submission for approval of Renevia?/SUP> in the EU is expected to be early 2018, with possible approval and commercial launch in 2018. There were no device related serious adverse events reported. OpRegen?/SUP>, a retinal pigment epithelium transplant therapy, is in a Phase I/IIa multicenter trial for the treatment of dry age-related macular degeneration, the leading cause of blindness in developing countries. There were no related serious adverse events reported. BioTime also has significant equity holdings in two publicly traded companies, Asterias Biotherapeutics, Inc. (NYSE American: AST) and OncoCyte Corporation (NYSE American: OCX), and a private company, AgeX Therapeutics, Inc.
To receive ongoing BioTime corporate communications, please click on the following link to join the Company뭩 email alert list: http://news.biotime.com. Top 100 AI companies 2018 by CB Insights and Top 5 AI companies for social impact 2017 by NVIDIA. The company pursues internal drug discovery programs in cancer, Parkinson's, Alzheimer's, sarcopenia and geroprotector discovery and provides services to pharmaceutical companies. Brief company video: https://www.youtube.com/watch?v=l62jlwgL3v8." type="text">Insilico Medicine, Inc. is a bioinformatics company located at the Emerging Technology Centers at the Johns Hopkins University Eastern campus in Baltimore. The company is widely recognized by the industry for applying next-generation artificial intelligence technology to drug discovery and aging research. For its pioneering work in the applications of Generative Adversarial Networks (GANs) and Reinforcement Learning (RL) and collaborations with the pharmaceutical companies it was selected as one of the Top 100 AI companies 2018 by CB Insights and Top 5 AI companies for social impact 2017 by NVIDIA. The company pursues internal drug discovery programs in cancer, Parkinson's, Alzheimer's, sarcopenia and geroprotector discovery and provides services to pharmaceutical companies. Brief company video: https://www.youtube.com/watch?v=l62jlwgL3v8. Certain statements contained in this release are 밼orward-looking statements?within the meaning of the Private Securities Litigation Reform Act of 1995. Statements pertaining to product technology, clinical development, regulatory approval timelines, the success of potential cosmetic applications and potential opportunities for BioTime, Inc. and its subsidiaries, along with other statements about the future expectations, beliefs, goals, plans, or prospects expressed by management constitute forward-looking statements. Any statements that are not historical fact including, but not limited to statements that contain words such as 뱖ill,?밷elieves,?뱎lans,?밶nticipates,?밻xpects,?밻stimates?should also be considered forward-looking statements. Forward-looking statements involve risks and uncertainties, including, without limitation, risks inherent in the development and/or commercialization of potential products, uncertainty in the results of clinical trials or regulatory approvals, need and ability to obtain future capital, and maintenance of intellectual property rights. Actual results may differ materially from the results anticipated in these forward-looking statements and as such should be evaluated together with the many uncertainties that affect the business of BioTime, Inc. and its subsidiaries, particularly those mentioned in the cautionary statements found in more detail in the 밨isk Factors?section of its Annual Reports on Form 10-K and Quarterly Reports on Form 10-Q filed with the SEC (copies of which may be obtained at www.sec.gov). Subsequent events and developments may cause these forward-looking statements to change. BioTime specifically disclaims any obligation or intention to update or revise these forward-looking statements as a result of changed events or circumstances that occur after the date of this release, except as required by applicable law.